buynow/bloglater: The ASOS Shoe Bargain! I was so excited to wear my outfit today that I even fake tanned in anticipation. This excitement was mainly fuelled by my new ASOS purchases. Who doesn't love breaking open the packaging and wearing new things? It's a great way to perk up a Monday anyway. What you see below are two new things - a Sister Jane layered blouse and some silver shoes. Blouse first. This is one of those fake layered tops because the jumper and shirt are attached. Normally I hate this but Sister Jane have done it well because the white layer is soft. floats nicely and lines the entire length of the jumper - it's not just a case of a sewn collar and separate footer. I love Sister Jane. Out of all the designers on ASOS it's one of my favourites. I think their items are original, well made and not outrageously priced. Now the shoes. The shoes. They are cheap and they are fabulous. I added them to basket on impulse and didn't expect much but I have been rewarded with a great looking model with a...get this...comfortable heel! These are shoes to walk in. I have already searched ASOS to see if they do this in any other colours and they do so I will definitely buy more. I love finds like this! Top: Sister Jane - Link! Shoes: ASOS - Link UK/Link US! I love those jeans! Your outfit is perfect as always. Heading over to ASOS right now to check for the heels. Cute and comfortable? Yes, please. I so want one of those bags....amazing and so classic in style. May have just accidently purchased the shoes. Love your outfit! I just found your blog recently and have now subscribed :). Wow what a brilliant bargain! I also really want that bag! LOVE these heels, beautiful. Also, loving your hair and outfit in general - beaut! Ooh, those silver heels are just fab! Love this outfit, as always, Laura! Oh my god, those shoes! They've photographed so much better in your photos than on the website too, they're stunning! When I first saw these on instagram I thought they might be Loubou's - a total steal at 25 pound notes! 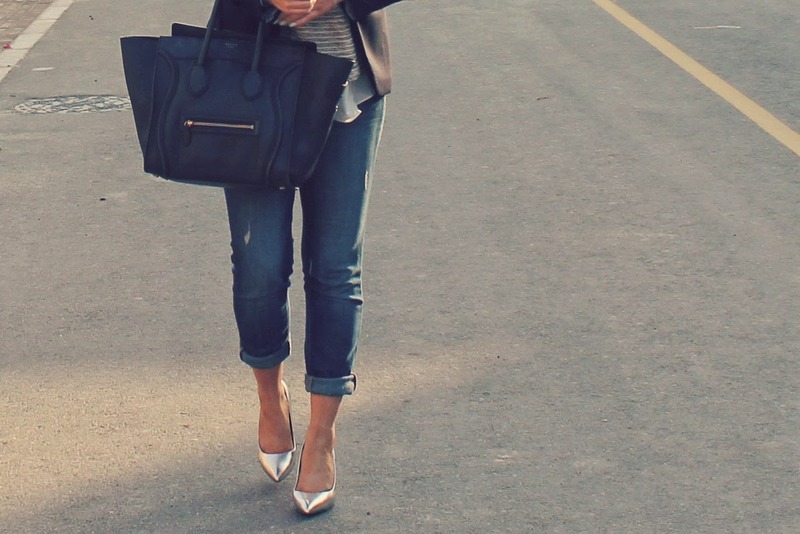 love the Celine and the shoess. I have been wanting a Celine bag like yours in a really long timee. Oh I love the shoes ! And the fact that there not too silvery is a nice plus. Thanks for sharing... if only I could wear slip on heels! Affordable shoes that are comfortable AND look glamorous? Lucky girl! Great outfit Laura, I went scouring asos for the fluoro blazer that you instagrammed earlier-Between yourself and Simone, my wardrobe is overflowing with boucle jackets! Do I spy a Cocoa Browned ankle in your photos?! my god, my god, loving he shoes!!! In love with your bag and sunnies! Obvs the rest looks great to! It really is an amazing outfit wow! I really impressed together with your writing skills as well as with the layout for your blog. Anyway keep up the excellent quality writing, I also have information about the new project Sikka Karmic GrThe Baya Park. Are the shoes true to size Laura? you must go here now to create one for yourself. Pandora Radio They will just play that song or songs you enjoy.